In the aftermath of the Paris Agreement at COP21, much was made of the decision to leave out shipping, and this has served to highlight the various factions amongst the stakeholders of the shipping industry. The debate has of late become ever more polarised, and has even been picked up by the non-specialist press (though with accompanying inaccuracies and misunderstandings, but perhaps not surprising in this day and age). Research and studies have been conducted by all involved, but we still end up with completely opposing claims - one group claiming ships have never been more efficient (generally measured per unit cargo), and others claiming that ship efficiency is stagnant, or even getting worse. Are they all measuring the same thing, speaking the same language, using the same definitions? Possibly not. But the situation is also not helped by the problem we have that most of the efficiency indicators do not properly measure actual ship efficiency for a variety of reasons - mainly to do with not accounting for the varying operating profile of most ships; and badly flawed input data. So how do we get the big picture view that allows us to understand and perhaps evaluate both these opposing viewpoints? The ICCT (International Council for Clean Transportation) recently published their report into shipping's CO2 emissions that fills in the figures for 2013-2015, picking up where the data for the 3rd IMO GHG study ended. This is a period that is hugely interesting for the shipping industry as it is a sort of overall scorecard for how the sector has been performing - at a time where more and more ecoships entered the fleet together with widespread awareness of energy efficiency. The period also covers the large drop in bunker price in Q3 2014. A different picture emerges when we go back further - there certainly appears to be a break in the long term trend post 2008. We certainly can't explain this in terms of regulation - EEDI came into force for ships built after 1 Jan 2013, so delivery would have been in 2014 or later, and new ships only account for around 2-3% per annum as a proportion of the entire world fleet. UNCTAD helpfully produces a yearly review of maritime transportation which is a fascinating treasure trove of statistics and figures. In amongst all the detail, they provide shipping demand in tonnes loaded and tonne miles. There is a slight dip in 2009 (not entirely unexpected) but the long term trend is upwards. UNCTAD doesn't publish data for every year prior to 2005 for tonnes loaded, but every 5 years. To provide context to the CO2 figures shown earlier, in 1990 they recorded about 4 billion tonnes loaded (4000 million tonnes in the chart above), in 1995 it was 4.6 billion tonnes loaded and in 2000 it was about 6 billion tonnes loaded. We are shipping about 2.5 times the amount of cargo (containers, bulk, oil & gas) in 2015 compared to 1990. In the same period world population grew from 5.3 billion to 7.4 billion. Make of that what you will. Now we all know that growth in cargo demand has been met with a growth in shipping capacity, both in numbers and in sizes. But how did the fleet change in those years? The CO2 graph for the same time period is included for context. The statistics excludes all vessels below 100 GT, so most fishing vessels and some domestic shipping are not included, which is why I'm using CO2 emissions for international shipping rather than all shipping. They don't correspond exactly, but I think the error is acceptable when looking at trends. The publicly available statistics I'm using also don't go earlier than 2007, but it is probably reasonable to assume that world GT has kept up with cargo demand growth. You might be wondering why I've used GT rather than DWT; I can assure you that the picture in DWT is very similar - the comparison was so uneventful that I didn't think it worth reproducing here. You can probably spot one obvious reason why shipping is suffering from overcapacity issues, but I digress. Cargo demand and fleet capacity have grown between 2007-2015, while CO2 emission has decreased. By some measures, certain sectors of shipping were already the most efficient form of transport in terms of CO2 emitted per tonne mile of cargo moved, so this further improvement is not to be sniffed at. On the other hand we are still a long way from where we need to be for a 2 or 1.5 degree scenario. The inevitable comparison is drawn with aviation who have agreed to carbon neutral growth from 2020 onwards – the above certainly looks like close to carbon neutral growth without resorting to offsetting or international regulation. None of which is to say that shipping should rest on its laurels. As a way of visualising the changes of CO2 and GT over time, we could use a composite measure - CO2/GT - ie the CO2 intensity per GT per annum which is a crude measure of fleet efficiency but accounts for both new ships and existing ships. This measure has gone from 1.23 to 0.7, a reduction of 43%. 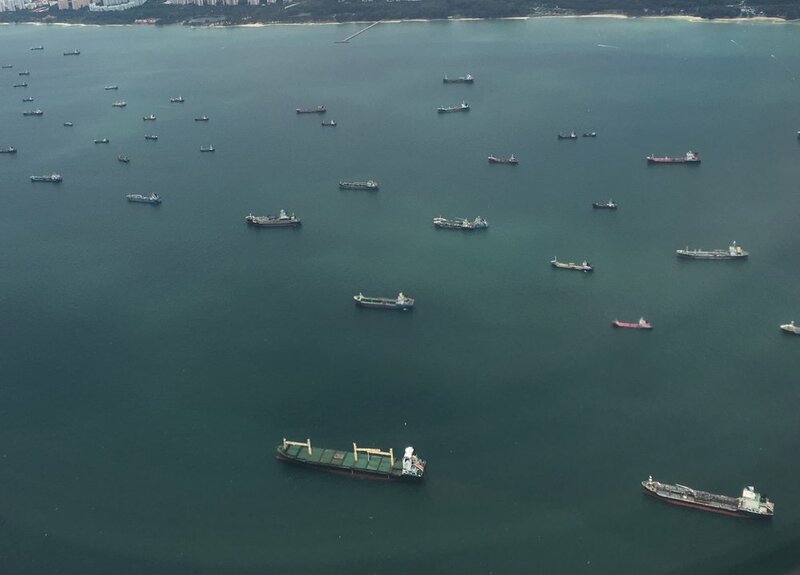 But this could also mask some things like overcapacity, low utilisation, idle ships, port congestion - lots of tonnage lying around doing nothing. However, since we have both tonne miles data and CO2, we could derive a rough measure in g CO2/tonne miles which is somewhat similar to EEOI, but for the fleet as a whole, a sort of fleet average CO2 intensity if you like. As of 2015, we are about 30% better off in gCO2 per tonne mile (21.6 to 15.2) than the peak year of 2008 for the fleet as a whole (new and existing ships), though not quite as rosy a picture as the CO2/GT version. The missing two years of data for 2005 and 2006 is purely because they were available for tonne miles, but not for GT. How you interpret this probably depends on your perspective – if you look on a per ship level (as a shipowner trying to balance the books will), this is progress achieved in the absence of regulation; but if you look from a world fleet perspective and total CO2 emissions, the growth in the world fleet has nullified the effect of efficiency improvements. As mentioned in above, we can't explicitly attribute any of this to the EEDI requirements as they apply only to newbuilds contracted from 2013 onwards (fleet replacement running around 3% per annum), which would only have been delivered from perhaps 2014 onwards or later, while the above charts are for the whole fleet. So how has shipping achieved these improvements fleet wide? The usual explanation is widespread slow steaming, and this has undoubtedly played a large part in the improvements seen to date and there are moves afoot to try to replicate this success by imposing a regulatory speed limit. However if speed were the only factor, one might expect a sharper drop in our gCO2 per tonne mile KPI followed by a plateau, unless the speed reduction was gradually applied. What other changes in the fleet would result in a gradual drop? 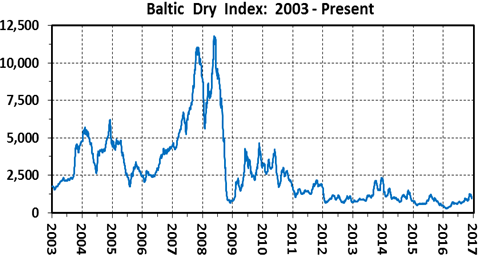 There have certainly been investment in energy saving measures – paint, hydrodynamic devices, hull optimisation, improved engine efficiencies, propeller optimisation, hull cleaning and so on, though it should be noted that shipping companies have found it challenging to quantify the benefits, even with big data. An often overlooked factor is ship size. 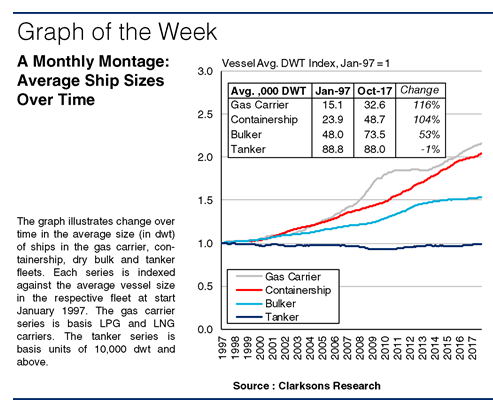 Clarksons Research helpfully produced some analysis recently showing that average ship sizes had increased over the last 20 years; in the case of gas carriers and container ships the average size had doubled in that time and were still growing. Bulk carriers were 50% larger, and only tankers were fairly constant, as one might expect. The Panama canal widening has also opened up possibilities for larger panamax ships with increased beam and reduced ballast designs. How does increasing ship size correlate with reduced CO2? 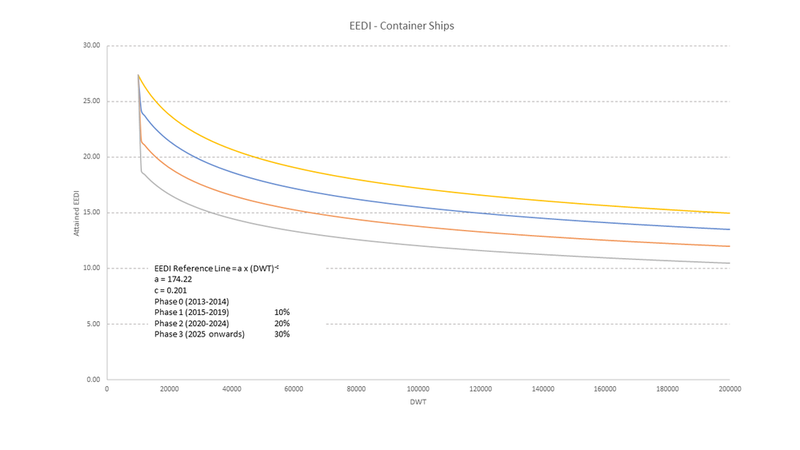 Look at any EEDI curve and you will notice that CO2 per tonne mile naturally decreases with increasing ship size, a function of efficiencies of scale. 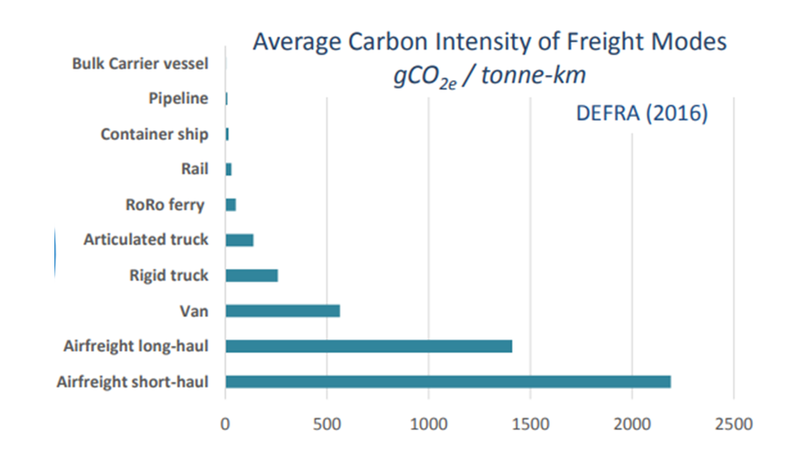 You also get a sense of how these efficiencies of scale work when you consider the average carbon intensity of freight modes - going from vans with single digit payloads, to trucks in the double digits and upwards to ships in the four to six digit range of deadweight. In terms of a driver for these changes, fuel price tends to be the obvious candidate - this was also my view until I started putting these numbers together. There doesn't appear to be much correlation between bunker price and CO2, though it should be noted that there is some difference in frequency - bunker price is shown quarterly and CO2 is yearly. A longer time series may also show some improved correlation. The large fluctuations in bunker price and the associated impact seems to make the effectiveness of any form of fuel levy somewhat difficult to predict and may indicate that the value of the levy would need to be larger than the likely fluctuation of the bunker price itself. It has been suggested that the market (in terms of charter rates) has a much stronger correlation and a cursory glance at the BDI or any of the container indices seem to bear this out. At the very least, proposals for a fuel levy or other carbon pricing would need to be carefully evaluated to ensure that the desired outcome of CO2 reduction is actually achieved. Coming back to the basic question in earlier, the world shipping fleet appears to be more efficient in 2015 than at any time between 2005 and 2015, with nearly all the 30% improvement occurring post 2009. The main driver for this does not appear to be regulations or high bunker prices, but the poor market conditions from 2009 onwards, although bunker prices may well have compounded the effect of the poor market. While slower operating speeds are most likely the major contributor to these improvements, the increase in the average size of ships is also likely to have played a part, along with awareness and investment into energy efficiency measures. In general, the term efficiency in this article is used somewhat loosely to mean the energy efficiency of transporting freight. Efficiency improvements are really aimed at reducing the amount of energy used per tonne mile, but there are limits to what can be achieved. As can be seen above, efficiency improvements are tailing off, and struggling to keep pace with the rate of world fleet growth which is in part a response to the growth in world trade. While industry stakeholders are working on ways to achieve further efficiency improvements, significant reduction in CO2 emissions can only be achieved with a shift to a non-carbon based marine fuel or energy storage medium.